Happy republic day to all my blog buddies & viewers. Wherever we r & whatever we do, be proud to be an Indian. To make this day special, I personally felt mutter paneer is most appropriate!!! isn't it?. Paneer could be made at home by simply bringing milk to a boil and using acid to separate the curd. The curds are then drained in a cheesecloth or muslin cloth and excess water is pressed out. It is a good source of protein. This taste great when mixed with vegetables. Green peas are one among the best combination. Cube the paneer into half inch pieces and deep-fry them on medium high heat. Fry until the paneer becomes a light golden color. In a pan, add oil and when hot, add jeera. Then add the cloves, cinnamon stick, bay leaf and elaichi and saute. Now add the grated onion, green chilly and saute well. Add the tomato puree and let it cook well until oil separates. Add some turmeric, chilli powder, dhania powder, garam masala to the yogurt and mix well. Add this yogurt mixture to the onions and cook. Add some water if needed. Then add the paneer pieces, mix well. In the end, add the thawed peas. If you are using fresh peas, first add the peas, cook and then add the paneer. Bring it to a boil. All time favorite paneer recipe is ready to be served with Bread or Chappatis or Rotis or naan. 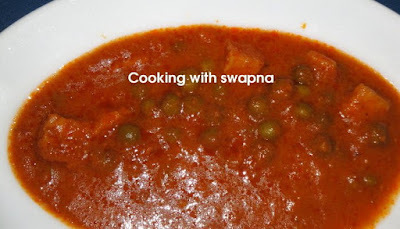 This is one of my fav gravy..so spicy and rich looking swapna. wow..that looks great...thanks for the entry!